756 km! A 15-hours drive from Ghaziabad, UP to Maihar, Madhya Pradesh via a merge of national highways and state highways. 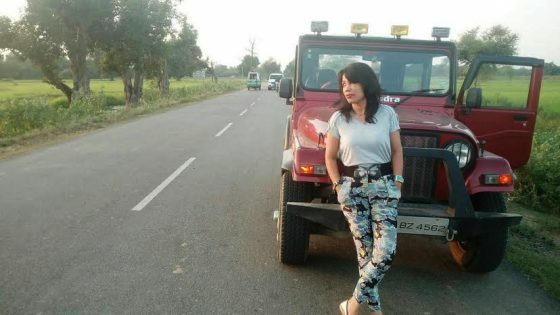 Me and my husband Yogaditya Singh Rawal with our Mahindra Thar to take us along. Miles of never-ending talks accentuated by flashbacks and untold incidents, laughter and smiles, humdrum discourses and familial chitchats amid folk music including Bollywood numbers from the 80’s, 90’s and latest. The hectic strain otherwise visible on our visages every morn, every noon, every eve had vanished. The road itself, mile after mile, turned into our destination. Far away from the metro chaos and the madding crowd! Away from the routine chores and stressful accountabilities for a livelihood! Bliss prevailed. We have together traversed thousands of kilometers across the length and breadth of India over a period of ten years by car and Thar. Yet there is so much left to explore! India mesmerizes us with her variegated beauty, flora and fauna, culture, history, and heritage. Both of us drive in turns. And when driving is passion for both, the effort of speeding along new roads, yet a familiar India, is rewarded. The sun plays hide and seek with us every now and then. Sometimes towards our left and sometimes towards the right, peeping behind trees, as our four-wheeled lion takes us along at 80-90 km per hour on an average. At times, the sun seems fiery, casting its splendor on us from the front, blurring our vision and affecting the tempo. On a summer day, even the AC seems to surrender to its rage. On a wintry day, the rays are more of a blessing. The vales and hills, rivers and lakes, plains and plateaus, paddies standing golden and extending towards the horizon are a delight to watch. Trees standing tall on either side of the road welcome us in whispers. Thanks to the breeze acting as the mediator between Nature and us! Ruins and monuments on the way often force us to stop. Our camera captures them. At times, miles of desolate lands without vegetation on either side make us ponder whether the soil is not fertile. And if it is fertile, we reflect that it could have been utilized for crop vegetation to feed thousands of starving bellies. The topic of farming, yields, government initiatives for farmers, effect of pesticides, and related paraphernalia takes over for some time. My husband was familiar with the Alha-Udal story since his childhood. A folk song aficionado, he chanced to bump into the Alha-Udal ballad on YouTube. And he fell in love with the entirety of it – the story, composition, chorus, and music. 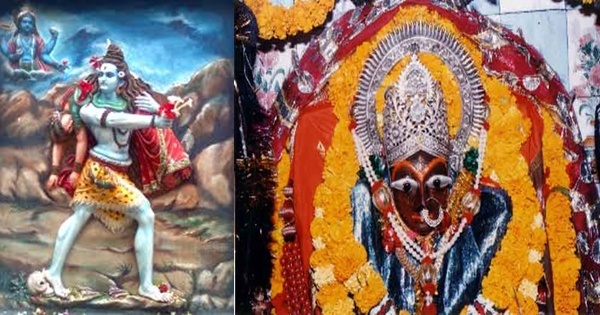 A part of the story of the ballad revolves around Alha’s devotion to Goddess Sharda Maa of Trikuta Hill, Maihar. Alha was a general of the Chandel king Paramardideva of Bundelkahnd of the later 12th century. His father Dasraj was also a successful commander of the same Chandel king. 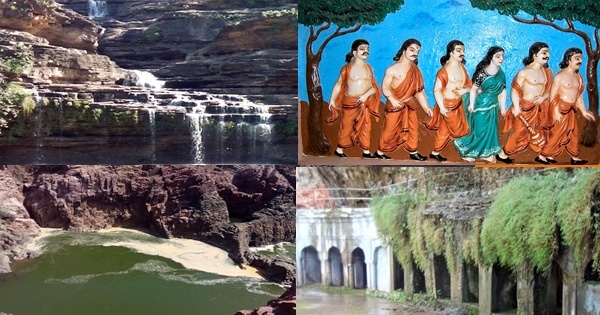 Alha and his brother Udal’s saga is immortalized in folklores and history, for their valor in protecting Mahoba, the region they were entrusted with, from enemies, especially the Chauhans and Turks. 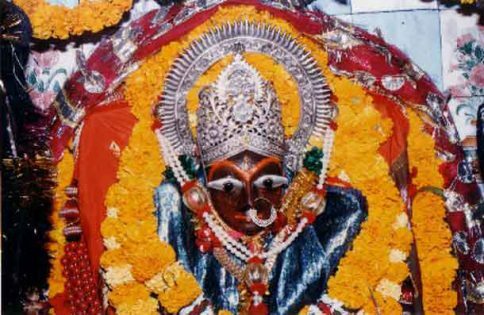 Local folklores plenteously glorify Goddess Sharda Maa’s (Maihar Mata’s) bond with Her devotees. It is said that wishes of every devotee who visits Sharda Maa get fulfilled. 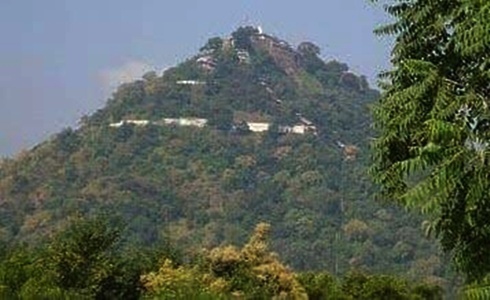 The king of Maihar erected a temple at the hilltop after the Goddess appeared in his dream and told him about Her presence at Trikuta Hill. Stairs leading to the temple from the base help devotees climb to the temple without hassles. 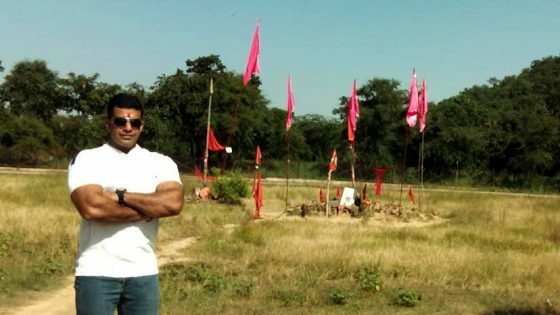 According to legend, Mahadev, carrying the body of the dead Sati, happened to walk by this region. The necklace (har) of the Goddess (mai) fell at this place. Hence the name ‘Maihar’, which means ‘necklace of mother’! Excavations at this region corroborate the existence of this town dating back to the Paleolithic Age. The ballad narrates about Alha, who did penance for 12 long years to win Sharda Maa’s blessings. At the end of his 12-year penance, Maa Sharda appeared in his dream and asked for his head as sacrifice. Alha told his fellow generals and the king about his dream. They forbade him, not to follow Maa Sharda’s demand. Alha, not paying heed to their advice, offered his head with his sword as sacrifice to the Goddess. Maa Sharda, pleased with Alha, blessed him with life. She blessed him with valour, strength, and immortality. 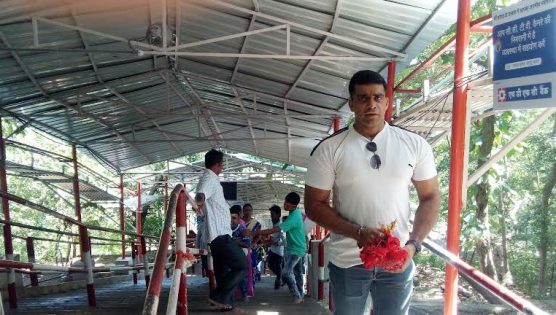 It is believed Alha visits Sharda Maa shrine to offer his prayers at dawn, the proof of which is visible everyday when the priests open the locked door of the temple. CCTV cameras inside and outside the temple fail to prove the mystery! Footprints, fresh flowers, and other paraphernalia suggesting offering of prayers are visible every morning before sunrise within the locked temple room!! 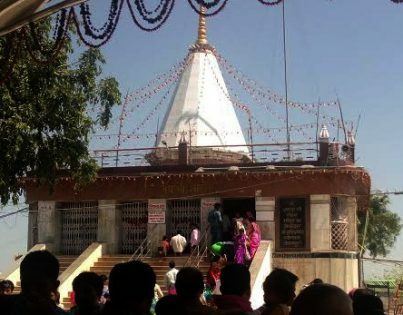 It was after listening to this ballad that my husband decided that we should visit Maa Sharda temple at Maihar. And our plan consummated after two years. The map helped us plan a week-long itinerary that included both our onward and return drive. 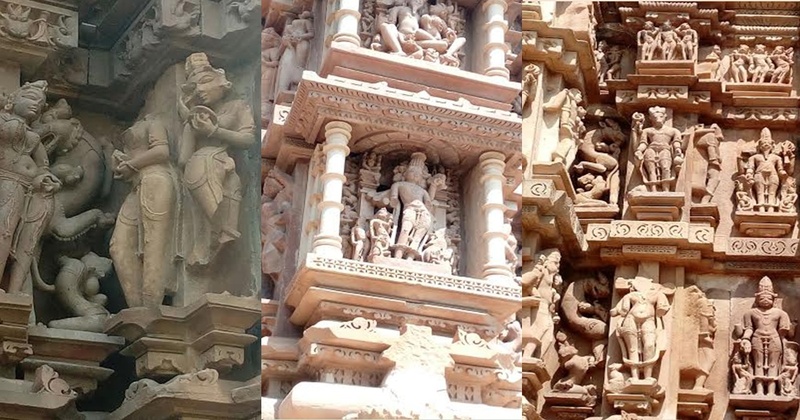 We sewed up with Maihar, Khajuraho, Panna, Ajaigarh Fort, Orchha, Jhansi, and Datiya. Our resting destinations were marked as Maihar, Khajuraho, and Orchha. We analyzed all alternate routes on the map via GPS and chose to cover more of national highways. 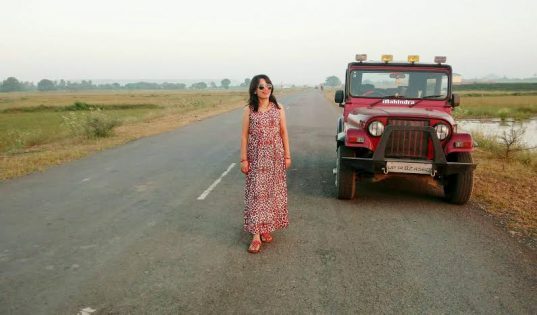 State highway roads are unpredictable, especially in UP. But with the Thar, even no roads are better; the only disadvantage being consumption of time! We had been to Madhya Pradesh earlier too on our Gwalior tour and the roads were smooth, except at few places. We started at dawn. As we covered distance of a few kilometers, the bright orange hue at the eastern horizon welcomed us. This was the sight we grew up with, every morn, in our childhood in the northeastern countryside. In the metro, tall buildings and apartments block the mystic and mesmerizing view. Our eyes caught sight of birds flying around, few hopping hither and thither. Many a pavement along the road bore the plod of jogging health-conscious personages. And the sun gradually overpowered darkness with its radiance. After a four-hour drive, we stopped at a restaurant for refreshment. We appeased our appetite with yummy dosa and coffee. And then we started along. All along the way, we stopped four times for food and refreshment until the GPS showed another two hours drive to Maihar. 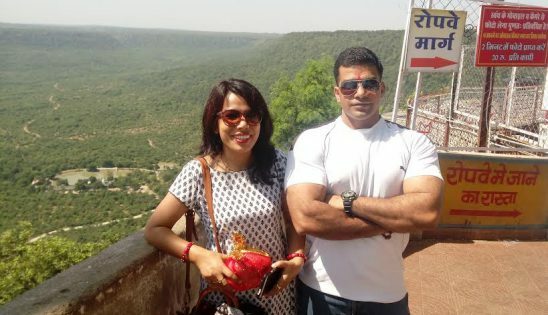 Wherever we go, we are completely dependent on our GPS, though at times, especially at tirahas and chaurahas, it gets confused, landing us on the wrong road. Rerouting and U-turn signals alert us. Auto drivers, truck drivers, and at times, roadside food sellers, are the people we bank upon then! 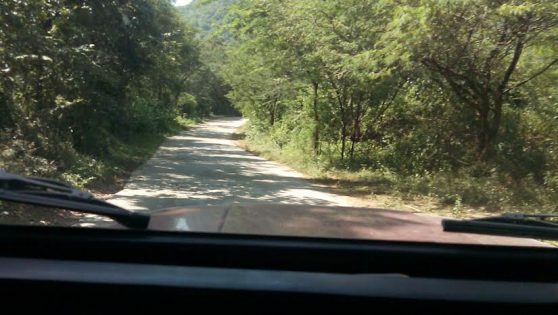 We had an adventurous drive for a few kilometers along a hilly terrain with dense jungles and almost no roads, except the GPS taking us along! The bumps and crater-like fissures every now and then lessened the speed of our Thar to an average of 10 km per hour. No signs of light far and near except the high beam of our Thar! A motorbike with solo rider followed us from a distance, but dust generated by our Thar seemed to affect his speed. Darkness prevailed everywhere. Scanty habitation was visible at few places, corroborated by dim lights illuminating courtyards. There, the standing trees and shrubs cast a shadowy and eerie refulgence, effectuated by the dim lights. A 40+ minutes drive and we reached the smooth road! The uneven boulevard gobbled our ‘reaching’ time by over an hour. We reached Maihar at 8 pm instead of the scheduled 7 pm. And we landed up in our hotel. Thanks to advanced booking! The room was spacious with a balcony at the back opening up to a lawn where neem trees kept the air fresh. ‘Early to bed and early to rise’ – it was an irony that we lived up to this maxim after months in this beautiful holy township of Maihar. The chaos of an otherwise metro life is yet to knock. In big cities, it is more of ‘late to bed and late to rise’ followed by activities as fast as a Shatabdi Express with hardly any time to breathe the relaxed way! And we were ready. We planned not to eat anything until we had a darshan of Maa Sharda. Our Thar and our GPS took us to the parking lot at the base of Trikuta Hill – a distance of around 5 km from our hotel. A boy, who sold flowers, advised us to leave our footwear in our vehicle. We followed his advice. The boy escorted us to his shop from where we bought prasad. We bought a garland of the red hibiscus from an old woman, selling flowers at a corner at the entrance of the shop. There were two ways to reach the temple – climb 1063 steps barefoot or set out by ropeway. We chose the stairs. 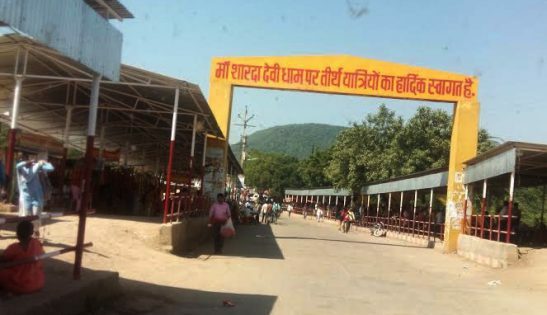 Thousands of devotees, including the young and the old, children and toddlers, couples and groups, climbed along, chanting ‘Jai Mata Di’, ‘Jai Maa Sharda’, ‘Jai Maihar Mata’. A blind man in his forties climbed up in silent steps lethargically, his stick and the blessings of Sharda Maa pushing him up without fail. Such is the reverence for Goddess Sharda! At few places, the steps were steep. 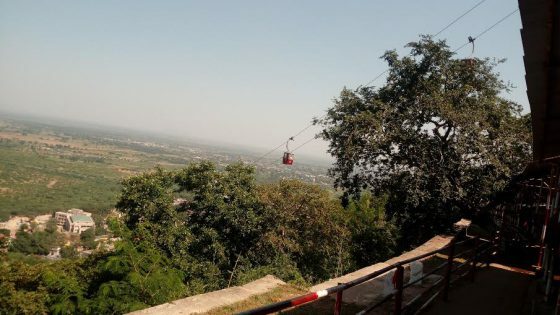 The green view all around with the town of Maihar below, were a feast for the eyes. And we reached the temple. We stood in queue. I found myself experiencing goose bumps as we neared the shrine. Such was the divine aura all around. There we were – both of us amid the crowd in queue, face to face with Maa Sharda. I felt tears in my eyes. We could feel Maa Sharda blessing us. I offered the prasad and the garland of hibiscus to the priest. In a second, the garland found itself at the feet of the Goddess of millions. The priest gave us our prasad. All of these happened in a few seconds. And guards asked us by gestures to move ahead so that the others in queue offered their prayers too. We sought blessings from Maa Sharda with the hope of coming back again. Descending was fast. We soon reached the base of Trikuta Hill. 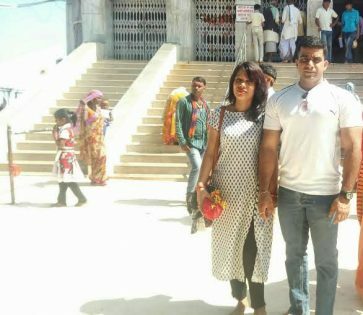 Our Thar took us to Alha Talab, the place where Alha took bath before offering prayers to Maa Sharda and Alha Akhara where he practiced wrestling and did penance for 12 years. 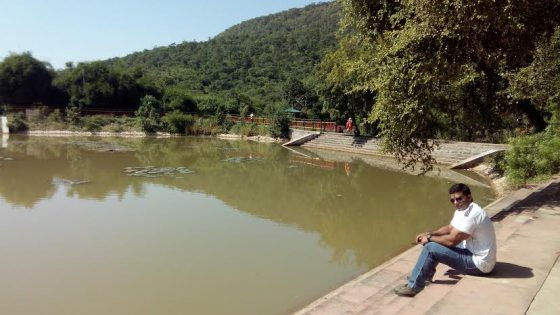 The Alha temple, located at the banks of the lake, was thronged by devotees. 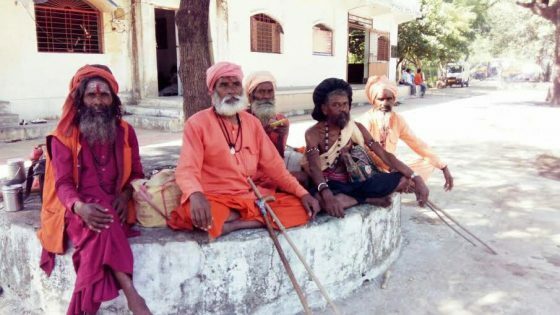 A few Sadhus made themselves comfortable under the shade of a tree in the temple premise. We came back to our hotel, had food, and decided to set out for Khajuraho, which was 136 km from Maihar. We set out at around 3.30 pm. 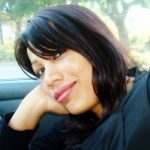 Stay tuned for my travelogues on Khajuraho, Panna, Ajaigarh Fort, Orchha, Jhansi, and Datiya at the ‘Travelogues’ section at myindiamyglory.com.